Local herb farms and schools take a slow, sustainable, transparent approach to growing and producing herbal medicine. 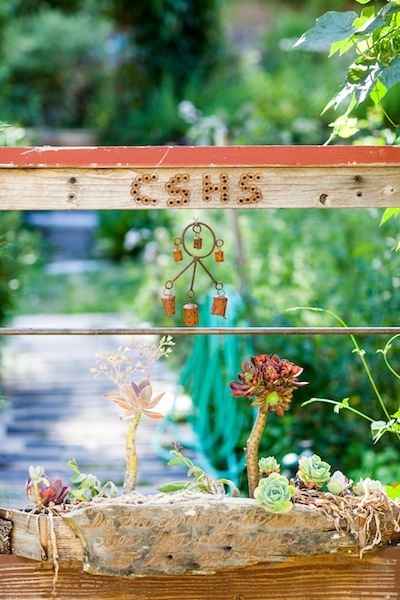 The California School of Herbal Studies (CSHS) sits on 80 acres down a gravel road off Hwy. 116 in Forestville’s Pocket Canyon. Mostly steep hillsides, the land is thick with Douglas Fir and the remains of redwood stakes from an old Italian-American vineyard. 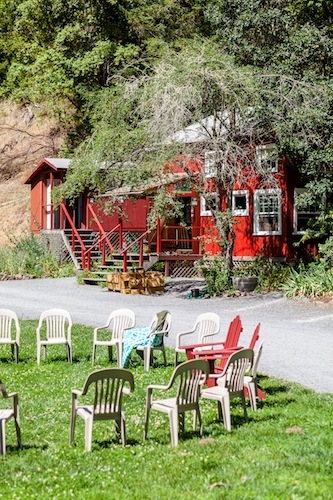 The lower five acres of the small campus—lush medicinal herb garden, medicine-making lab, a yurt and a straw bale structure—bathes in sunshine for several hours a day. Terraces and garden beds built of rocks, hauled in from the nearby Russian River by the early student body, house a mesmerizing array of medicinal herbs: motherwort, skullcap, vetiver, and dozens of others. 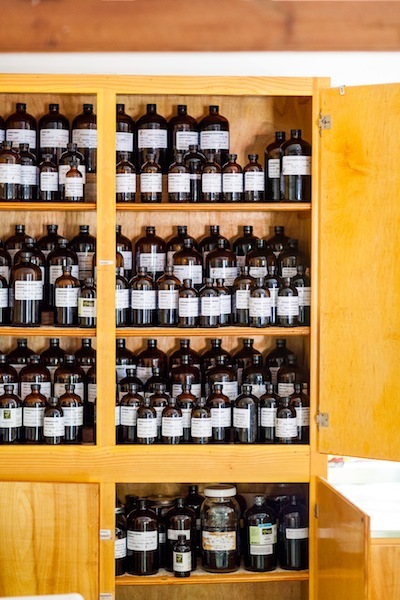 Walking through the quiet school campus, it is easy to forget that Americans spend roughly $35 to $50 billion on herbal medicine products annually, a number that’s predicted to rise to $115 billion by 2020. From St. John’s Wort tinctures for depression to green coffee extract pills for weight loss, many herbal supplements are mass-produced as fad products with little transparency as to how—or where—the ingredients were cultivated. As a result, medicinal plants like American ginseng, goldenseal, and sandalwood risk over-cultivation. Ensuring that products are ethically harvested, used appropriately, and produced sustainably is a challenge. Sonoma County has a long history of bucking that trend. Educational centers like the CSHS, Chinese Medicinal Herb Farm in Petaluma, and Botanical Dimensions’ ethnobotanical research library in Occidental, bridge the information gap with a slower, more conscious, transparent approach to growing, studying, and producing herbal medicine. It’s good for the local economy. Though there are at least a few reputable herbal product corporations based in Sonoma County, there are even more local independent herbal apothecaries like Santa Rosa’s Farmacopia, Sebastopol’s Rosemary’s Garden, and Occidental’s West County Herbs that have close relationships with the schools, farms, and small-scale product developers. Back at the CSHS, roughly 25 students at any given time attend a certificate program that incorporates medicinal herb knowledge with cultivating, growing, and preparing plants as medicine. Another 300 students sign up for one-day classes and shorter series that are offered at the school. Rebecca Maxfield co-directs the CSHS with her husband, Jason Miller. She enrolled as a student in 1993 and took on a leadership role in 2001. At that point, the faculty had already been teaching the fundamentals of plant medicine to bright-eyed young herbalists since the late 1970s, when famed herbalist, teacher, and author Rosemary Gladstar founded the program. Other classes cover local wild foods, medicinal mushrooms, medicine making, essential oils, and herbal beer brewing. After completing the full-time, eight-month intensive certificate program for roughly $7,000, students have gone on to work as medicinal herb growers, natural food caterers, marketing directors for major holistic wellness companies, natural fiber clothing designers, tea makers, and botanists. A number of nurses have attended the program to enhance the services they offer their patients. Her faculty tends to agree. Like ethnobotanist Kat Harrison, some have taught at the school for decades. Last November, Harrison, who has studied ethnobotany for 45 years, opened an ethnobotanical research library at the Occidental Center for the Arts. The library is a project of Botanical Dimensions, Harrison’s nonprofit organization, which has helped preserve native—mostly medicinal—plant species in Costa Rica, Peru, Southern Mexico, and Hawaii. In addition to running the library, Harrison teaches on field research trips to Ecuador and Hawaii, at national and international herbal symposiums, and at conferences focusing on psychedelics. Members pay a yearly fee of $35 to access the library archives. Bookshelves are neatly stacked with publications on everything from women’s health to shamanic healing to the power of the psychoactive Ayahuasca brew, which Harrison encountered for the first time in the Amazon basin in the early ‘70s while traveling with her former husband, the late Terrence McKenna. “Mostly [I teach] big ideas about history, evolution, cultures and comparative cultures, and how humans use plants in a similar way to solve similar problems wherever they are,” says Harrison. 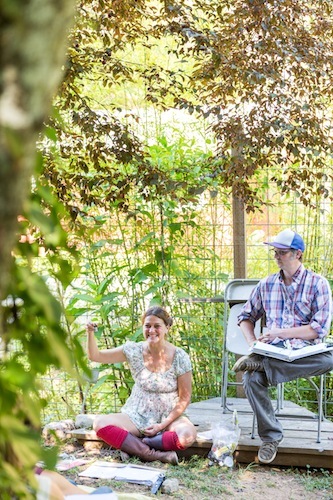 West Sonoma County offers a fertile community soil for Harrison’s work. “The small style here, the orchards, farmers’ markets are integral parts of cultural revitalization that our culture was very hungry for, even if we didn’t consciously know it,” says Harrison. Not everybody needs to be an herbalist, she adds, but knowing plant knowledge and expertise runs deep through the community is empowering in and of itself. A few miles south, Peg Schafer runs the Chinese Medicinal Herb Farm among the rolling hills of western Petaluma. Trained in nursery management, Schafer started farming Chinese herbs 20 years ago, partly to avoid competition with local vegetable farmers. At the time, Chinese medicinal herb cultivation was a niche market. It still is. For that reason, Schafer wrote The Chinese Medicinal Herb Farm: A Cultivator’s Guide to Small-Scale Organic Herb Production. She also launched an apprentice program for farmers interested in growing these specialty crops. Schafer doesn’t consider herself an herbalist. Instead, like many people who take to edible gardening, she started farming Chinese medicinal herbs because she wanted to know exactly where they were coming from. “I like to eat food that is recognizable, fresh, and organic, but the herbs I was taking were none of the above,” she says. On her farm, she grows some of the more popular Chinese herbs: astragalus, licorice, chrysanthemum flowers, dong quai, Solomon’s seal, and gingko, to name a few. Schafer sells selectively to local buyers: acupuncturists, researchers, progressive pharmacies, and acupuncture and Asian medical schools; in other words, a traditional market that understands the history and use of the herbs. With few U.S. farms specializing in Chinese herbs, Schafer puts the spotlight on education, both on and off the farm. A hands-on internship sees up to 20 participants each season. Educational tours draw a number of international guests each year. She travels across the country regularly, connecting growers, acupuncturists, and Asian medicine practitioners. 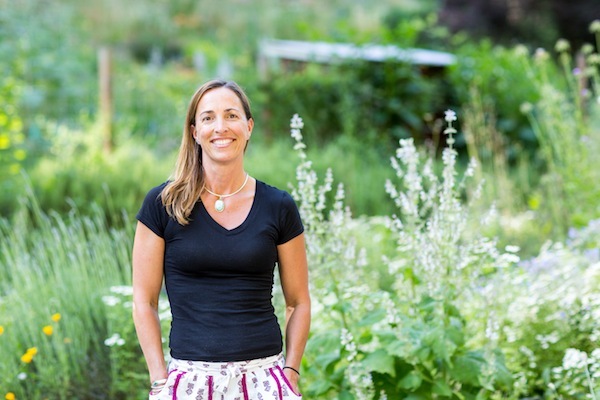 Schafer also supports local farmers as a founding member of the Sonoma County Herb Exchange, which connects medicinal herb farmers to practitioners and other buyers. The herb exchange’s history goes back to 1957, when Lynn and Geoff Howe started the Organic Garden and Nutrition Club of Sonoma County. Eventually, thanks to a growing interest in local agriculture, they morphed into the Sonoma County Herb Association. 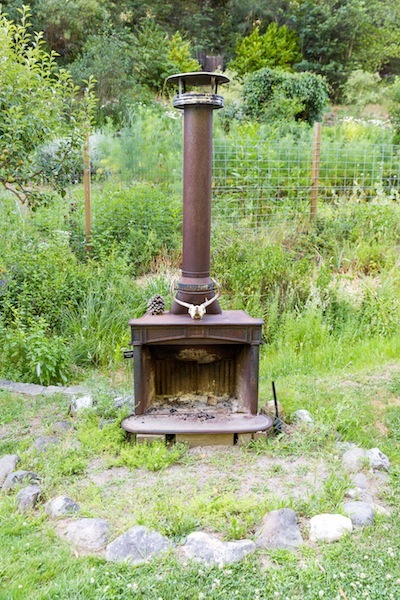 In 1999, the organization birthed the Sonoma County Herb Exchange. On Tuesday mornings, local farmers deliver freshly picked, pre-ordered crops to the Herb Exchange headquarters at Sebastopol’s Laguna Farm, where a team of energetic, knowledgeable volunteers inspect the herbs for efficacy before packaging them up to ship out. On a recent Tuesday, tables were piled with fresh lemon balm. A bag of vibrant yellow calendula sat on a nearby counter. Fragrant elderflowers were spread across another table. Locally grown yarrow, nettles, tulsi, echinacea, and German chamomile pass through, depending on the season. With a booming market throwing herbal ingredients like gingko and echinacea into everything from face creams to dietary supplements, Sonoma County is blessed with an educated, transparent community of herb practitioners and educational programs that support the sustainable use of these magical plants and the farmers that grow them. It’s a collaborative network of the very best kind.